At approximately 2023 hours on February 23,1991, a smoke detector was activated on the 22nd floor of the One Meridian Plaza building. The activated detector is believed to have been located at the entrance to the return air shaft in the northeast comer of the building. At that time there were three people in the building, an engineer and two security guards.’ The alarm sounded throughout the building and elevator cars automatically returned to the lobby. The building engineer investigated the alarm using an elevator on manual control to go to the 22nd floor. The central station monitoring company that served the building reportedly called the guard desk in the lobby to report the alarm. The call came in before the engineer reached the fire floor, and the alarm company was told that the source of the alarm was being investigated. The alarm company did not notify the Fire Department at that time. When the elevator doors opened at the 22nd floor, the engineer encountered heavy smoke and heat. Unable to reach the buttons or to leave the elevator car to seek an exit, the building engineer became trapped. He was able to use his portable radio to call the security guard at The building staff regulated the after-hours population of the building through a lighting request system where tenants lights would be turned on for the duration of their work. In addition, there was a security system in the building that recorded any passage through stairwell doors. the lobby desk requesting assistance. Following the trapped engineer’s instructions, the security guard in the lobby recalled the elevator to the ground floor using the Phase II firefighter’s safety feature. The second security guard monitored the radio transmissions while taking a break on the 30th floor. This guard initially mistook the fire alarm for a security alarm believing that he had activated a tenant’s security system while making his rounds. He evacuated the building via the stairs when he heard the building engineer confirm there was a fire on the 22nd floor. The roving guard reported that as he descended from the 30th floor the stairway was filling with smoke. He reached the ground level and met the engineer and the other security guard on the street in front of the building. The Philadelphia Fire Department report on the incident states that the lobby guard called the alarm monitoring service to confirm that there was an actual fire in the building when the engineer radioed to her from the 22nd floor. After meeting outside and accounting for each other’s whereabouts the three building personnel realized that they had not yet called the Fire Department. The first call received by the Philadelphia Fire Department came from a passerby who used a pay telephone near the building to call 911. The caller reported smoke coming from a large building but was unable to provide the exact address. While this call was still in progress, at approximately 2027 hours, a call was received from the alarm monitoring service reporting a fire alarm at One Meridian Plaza. The Philadelphia Fire Department dispatched the first alarm at 2027 hours consisting of four engine and two ladder companies with two battalion chiefs. The first arriving unit, Engine 43, reported heavy smoke with fire showing from one window at approximately the mid-section of the building at 2031 hours. A security guard told the first arriving battalion chief that the fire was on the 22nd floor. Battalion Chief 5 ordered a second alarm at 2033 hours. While one battalion chief assumed command of the incident at the lobby level, the other battalion chief organized an attack team to go up to the fire floor. 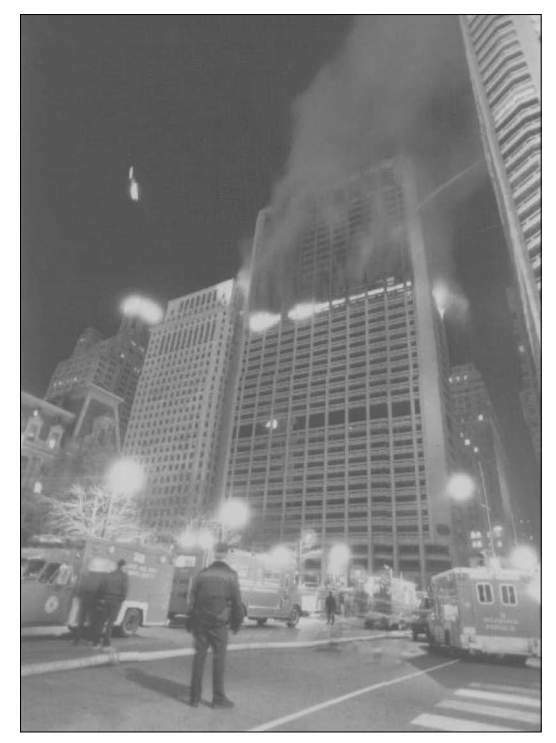 (The Philadelphia Fire Department’s “High-rise Emergency Procedures” Operation Procedure 33 is presented in Appendix C.) The battalion chief directed the attack team to take the low-rise elevators up the 11th floor and walk up from there. Shortly after the battalion chief and the attack team reached the 11th floor there was a total loss of electrical power in the building. This resulted when intense heat from the fire floor penetrated the electrical room enclosure. The heat caused the cable insulation to melt resulting in a &ad short between the conductor and the conduit in both the primary and secondary power feeds, and the loss of both commercial power sources. The emergency generator should have activated automatically, but it failed to produce electric power. These events left the entire building without electricity for the duration of the incident in spite of several efforts to restore commercial power and to obtain power from the generator. This total power failure had a major impact on the firefighting operations. The lack of lighting made it necessary for firefighters to carry out suppression operations in complete darkness using only battery powered lights. Since there was no power to operate elevators, firefighters were forced to hand carry all suppression equipment including SCBA replacement cylinders up the stairs to the staging area that was established on the 20th floor. In addition, personnel had to climb at least 20 floors to relieve fellow firefighters and attack crews increasing the time required for relief forces to arrive. This was a problem for the duration of the incident as each relief crew was already tired from the long climb before they could take over suppression duties from the crews that were previously committed. By this time fire was visible from several windows on the 22nd floor and crews outside were evacuating the area around the building and hooking up supply lines to the building’s standpipe connections. As flames broke through several more windows around a major portion of the fire floor, the floor above was subject to autoexposure from flames lapping up the side of the building. Additional alarms were called to bring personnel and equipment to the scene for a large scale fire suppression operation. As the fire developed on the 22nd floor, smoke, heat, and toxic gases began moving through the building. Vertical fire extension resulted from unprotected openings in floor and shaft assemblies, failure of fire-resistance rated floor assemblies, and the lapping of flames through windows on the outside of the building.